In the year 1521 a cannon ball fractured the left leg of Captain Ignatius Loyola, the future founder of the Jesuits. While he was convalescing, Ignatius read about Christ and His saints and thus turned wholly to God. He then undertook to equip himself for Christ's service by acquiring a good classical and theological education. The members of the Society of Jesus became the shock troops of the Church in the battle against the spread of Protestantism in Europe, as well as one of the greatest foreign mission organizations that the world has known. This war he carried on with such success that it has always been the universal opinion, confirmed by the word of pontiffs, that God raised up Ignatius and the Society founded by him to oppose Luther and the heretics of his time, as formerly he had raised up other holy men to oppose other heretics. In the sixteenth century satan made a formidable attack upon the Holy City, by means of a man who, like himself, had fallen from the height of heaven, a man prevented in early years by the choice graces which lead to perfection, yet unable in an evil day to resist the spirit of revolt. As lucifer aimed at being equal to God, Luther set himself up against the Vicar of God, on the mountain of the covenant, and soon, falling from abyss to abyss he drew after him the third part of the stars of the firmament of Holy Church. How terrible is that mysterious law whereby the fallen creature, be he man or angel, is allowed to keep the same ruling power for evil which he would otherwise have exercised for good. But the designs of eternal Wisdom are never frustrated: against the misused liberty of the angel or man is set up that other merciful law of substitution, by which St. Michael was the first to benefit . Saint Ignatius of Loyola made the restoration of piety among Catholics his first care. He increased the beauty of the sacred buildings, the giving of catechetical instructions, the frequency of sermons and of the sacraments. He everywhere opened schools for the education of youth in piety and letters. St. Philip Neri and others saw his countenance shining with heavenly light. At length in the sixty-fifth year of his age he passed to the embrace of his Lord, whose greater glory he had ever preached and ever sought in all things. He was celebrated for miracles and for his great services to the Church, and Gregory XV enrolled him amongst the saints; while Pius XI, in response to the prayers of the episcopate, declared him heavenly patron of all Spiritual Exercises. Soul of Christ, santify me. Never let me be separated from you. and bid me come to you. St. Peter serves the Church as a man, and St. Martha serves as a woman -- and we honor and keep the Feasts of each! Let us follow the traditions and read more about life of Saint Martha who can give us strenght to fight to holy fight against evil , represented often by a dragon . After the ascension of our Lord, when the disciples were departed, she with her brother Lazarus and her sister Mary, also S. Maximin which baptized them, and to whom they were committed of the Holy Ghost, and many others, were put into a ship without sail, oars, or rudder governail, of the paynims, which by the conduct of our Lord they came all to Marseilles, and after came to the territory of Aquense or Aix, and there converted the people to the faith. Martha was right facound of speech, and courteous and gracious to the sight of the people. There was that time upon the river of Rhone, in a certain wood between Arles and Avignon, a great dragon, half beast and half fish, greater than an ox, longer than an horse, having teeth sharp as a sword, and horned on either side, head like a lion, tail like a serpent, and defended him with two wings on either side, and could not be beaten with cast of stones nor with other armour, and was as strong as twelve lions or bears; which dragon lay hiding and lurking in the river, and perished them that passed by and drowned ships. He came thither by sea from Galicia, and was engendered of Leviathan, which is a serpent of the water and is much wood, and of a beast called Bonacho, that is engendered in Galicia. And when he is pursued he casts out of his belly behind, his ordure, the space of an acre of land on them that follow him, and it is bright as glass, and what it toucheth it burneth as fire. To whom Martha, at the prayer of the people, came into the wood, and found him eating a man. And she cast on him holy water, and showed to him the cross, which anon was overcome, and standing still as a sheep, she bound him with her own girdle, and then was slain with spears and glaives of the people. The dragon was called of them that dwelled in the country Tarasconus, whereof, in remembrance of him that place is called Tarasconus, which tofore was called Nerluc, and the Black Lake, because there be woods shadowous and black. And there the blessed Martha, by licence of Maximin her master, and of her sister, dwelled and abode in the same place after, and daily occupied in prayers and in fastings, and thereafter assembled and were gathered together a great convent of sisters, and builded a fair church at the honour of the blessed Mary virgin, where she led a hard and a sharp life. She eschewed flesh and all fat meat, eggs, cheese and wine; she ate but once a day. An hundred times a day and an hundred times a night she kneeled down and bowed her knees. The exact nature of the (obviously now-extinct) creature being called a "dragon" is unknown (many Saints have been credited with having dealt with "dragons" -- Saints Margaret of Antioch and George being the two best-known -- and, of course, St. Michael will have his way with the Dragon of Dragons in the end!). But in any case, St. Martha's conquering of the beast known as "La Tarasque" has been commemorated in Tarascon, France (the town was named for the animal) ever since A.D. 1474 when "Good King Rene" instituted an annual celebration which continues to this day and takes place now in the last weekend of June. The town lies just between Avignon and Arles, on the left bank of the Rhone River, in a part of France famous for caves filled with "prehistoric" art. O blessed St. Martha, your faith led Jesus to proclaim, "I am the resurrection and the life"; and faith let you see beyond his humanity when you cried out, "Lord I believe that you are the Messiah, the Son of God." With firm hope you said, I know that God will give you whatever you ask of him, and Jesus called your brother Lazarus back from the dead. With pure love for Jesus you welcomed him into your home. Friend and servant of our Savior, I too am "troubled about many things." (Pause for silent prayer.) Pray for me that I may grow in faith, hope and love, and that Jesus, who sat at your table, will hear me and grant me a place at the banquet of eternal life. Amen. Jesus was a frequent guest at Martha's home in Bethany, a small village two miles from Jerusalem. We read of three visits in Luke 10:38-42, John 11:1-53, and John 12:1-9. Many of us find it easy to identify with Martha in the story Luke tells. Martha welcomes Jesus and his disciples into her home and immediately goes to work to serve them. Hospitality is paramount in the Middle East and Martha believed in its importance. Imagine her frustration when her sister Mary ignores the rule of hospitality and Martha's work in order to sit and listen to Jesus. Instead of speaking to her sister, she asks Jesus to intervene. Jesus's response is not unkind, which gives us an idea of his affection for her. He observes that Martha is worried about many things that distract her from really being present to him. He reminds her that there is only one thing that is truly important -- listening to Him. And that is what Mary has done. In Martha we see ourselves -- worried and distracted by all we have to do in the world and forgetting to spend time with Jesus. It is, however, comforting to note that Jesus loved her just the same. The next visit shows how well Martha learned this lesson. She is grieving the death of her brother with a house full of mourners when she hears that Jesus has just come to the area. She gets up immediately and leaves the guests, leaves her mourning, and goes to meet him. Her conversation with Jesus shows her faith and courage. In this dialogue she states clearly without doubt that she believes in Jesus' power, in the resurrection, and most of all that Jesus is the Son of God. Jesus tells her that He is the Resurrection and the Life and then goes on to raise her brother from the dead. Our final picture of Martha in Scripture is the one that sums up who she was. Jesus has returned to Bethany some time later to share a meal with his good friends. In this home were three extraordinary people. We hear how brother Lazarus caused a stir when was brought back to life. We hear how Mary causes a commotion at dinner by annointing Jesus with expensive perfume. But all we hear about Martha is the simple statement: Martha served . Jesus therefore, six days before the pasch, came to Bethania, where Lazarus had been dead, whom Jesus raised to life. And they made him a supper there: and Martha served. But Lazarus was one of them that were at table with him. Mary therefore took a pound of ointment of right spikenard, of great price, and anointed the feet of Jesus, and wiped his feet with her hair; and the house was filled with the odour of the ointment. In this Bible text we can read that Martha was't in the spotlight, she doesn't do showy things, she doesn't receive spectacular miracles. She simply serves Jesus. Saint Anne, chosen by God to be the mother of Mary, His own Blessed Mother on earth, was the spouse of Saint Joachim. Ancestor of the Eternal King and High Priest, Joachim was of the royal house of David, while Anne was of Levitical descent. Their lives were wholly occupied with prayer and good works. One thing only was wanting to their union — they were childless, and this was held as a bitter misfortune among the Jews. At length, when Anne was well advanced in age, Mary was born, the fruit rather of grace than of nature, and the child more of God than of man. How holy must have been the woman in whom the great mystery of the Immaculate Conception was accomplished! How holy the womb into which the fullness of grace descended, in which the child "full of grace" was conceived and took flesh! Great was the dignity of St. Elizabeth, the mother of St. John the Baptist, who was privileged to have her son sanctified in her womb; but how much greater is the dignity of St. Anne, whose child, by a special prerogative, from the first instant of her conception was preserved from all taint of sin! Holy was the root from which sprouted the tree that bore the holiest Fruit, Jesus. St. Anne's sanctity was increased still more through this wonderful conception: and indeed, how highly must she have been sanctified who bore the Mother of God ! Yes, great indeed was the privilege and dignity conferred by God on St. Anne in electing her to be the mother of the treasury of all graces! How great must have been St. Anne's joy, how blissful her delight, when, contrary to all hope, she gave birth to a child! And what a child! Never before had earth beheld a child so fair and noble as Anne's infant daughter, "conceived without stain of Original Sin." Never had there been a maternity so rich in blessings as hers-----she who was privileged to call her child by the exalted title of "Mother of God." Well indeed might St. John Damascene, a great Doctor of the Church, exclaim: "Blessed, thrice blessed art thou, O Saint Anne, who didst receive from God and bring forth the blessed child from whom proceeded Christ, the Flower of life! We congratulate thee, O blessed Anne, on the dignity of being the mother of Mary, for thou hast brought forth our common hope, the germ of Promise! All pious lips bless thee in thy daughter, all languages glorify thy child! Worthy art thou above all praise, worthy of the praise of all who are redeemed, for thou hast given life to her who brought forth our Savior, Jesus Christ." Blessed Saint Anne , pray for us poor sinners and protect us as you protected Immaculate Mary Mother of God! Contemplating the crucified Lord and in intimate union with his Passion, Saint Bridget was able, with prophetic determination, to complete the mission which Christ had entrusted to her for the good of the Church and society at that time.In a difficult and complicated age of the history of the Church and of Europe, this disciple of the Lord never stopped working for the genuine progress of the unity of believers.Today we remember this holy woman with a passion for Christian unity that sustained her entire life.Saint Bridget’s love for the Church and her witness to the Cross are a model for us all.May St Bridget be our example and intercessor. "True wisdom, then, consists in works, not in great talents, which the world admires; for the wise in the world's estimation . . . are the foolish who set at naught the will of God, and know not how to control their passions." Lord our God, you revealed the secrets of heaven to St. Bridget as she meditated on the suffering and death of your Son. May your people rejoice in the revelation of your glory. Grant this through our Lord Jesus Christ, your Son, who lives and reigns with you and the Holy Spirit, one God, forever and ever. Amen. We give thanks to the Lord for giving us this distinguished and holy daughter of Sweden, who was a unique witness to the deep Christian roots of European civilization. Daughter of Birger Persson, the governor and provincial judge of Uppland, and of Ingeborg Bengtsdotter, Bridget was born in Sweden in 1303. From the time she was a child, she was greatly devoted to the passion of Jesus. When she was only ten, it is recorded that she had a vision on Jesus on the cross and heard him say, “Look at me, my daughter." "Who has treated you like this?" cried little Bridget. Jesus answered, "They who despise me and refuse my love for them.” From that moment on, Bridget tried to stop people from offending Jesus. When she was 14, she married 18-year old Ulf. Like Bridget, Ulf had set his heart on serving God. They had eight children, of whom one was St. Catherine of Sweden. Bridget and Ulf served the Swedish court. Bridget was the queen's personal maid. Bridget tried to help King Magnus and Queen Blanche lead better lives, however for the most part, they did not listen to her. All her life, Bridget had marvelous visions and received special messages from God. In obedience to them, she visited many rulers and important people in the Church. She explained humbly what God expected of them. After her husband died, Bridget put away her rich clothes and lived as a poor nun. Later, in 1346, she began the order of the Most Holy Savior, also known as Bridgettines. She still kept up her own busy life, traveling about doing good everywhere she went. And through all this activity, Jesus continued to reveal many secrets to her. These she received without the least bit of pride. Shortly before she died, the saint went on a pilgrimage to the Holy Land. At the shrines there, she had visions of what Jesus had said and done in each place. All St. Bridget's revelations on the sufferings of Jesus were published after her death. St. Bridget died in Rome on July 23, 1373. She was proclaimed a saint by Pope Boniface IX in 1391. Saint Bridget , thank you for your prayers and revelations , be our Protector and Intercessor in Heaven ! St. Birgitta, fearless in the service of God, pray for us. St. Birgitta, patient in suffer­ing and humiliation, pray for us. St. Birgitta, marvellous in thy love towards Jesus and Mary, pray for us. 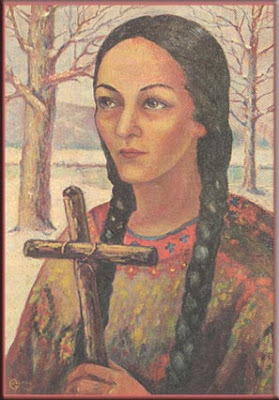 God, who among the many marvels of Your Grace in the New World, did cause to blossom on the banks of the Mohawk and of the St. Lawrence, the pure and tender Lily, Kateri Tekakwitha, grant, we beseech You, the favor we beg through her intercession -- that this Young Lover of Jesus and of His Cross may soon be counted among her Saints by Holy Mother Church, and that our hearts may be enkindled with a stronger desire to imitate her innocence and faith. Through the same Christ Our Lord. Amen. The young woman now honored with such beautiful titles as "the Lily of the Mohawks" and "the Wonderworker of the New World" was born in 1656 at Ossernenon, a village of longhouses which stood on a high hill overlooking the Mohawk River. The daughter of a Turtle Clan chief and a Christian Algonquin captive, she was orphaned at the age of four when a smallpox epidemic decimated Ossernenon . Her great devotion to Our Lord is one of the most profound aspects of her story and one that is occasionally overlooked these days when her life is simplified and sentimentalized. Yet it was Kateri herself who said, "I have given my soul to Jesus in the Eucharist and my body to Jesus on the Cross." above you to bless you! Awesome Blogs and Bloggers , God bless ! Get the AirMaria: Video and Multimedia that is Catholic widget and many other great free widgets at Widgetbox!